We woke up to beautiful light blanket of snow this morning! E prayed for snow last night (because we have had hardly any this year!) and here it is. He was so excited when he first looked out the window! 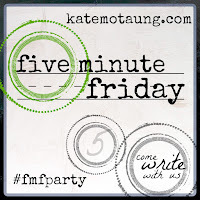 Today's Five-Minute Friday free-write word is "Reflect". Writing out the address over and over again can be a monotonous job but it gives me time to reflect on the year. I look at our family and all of the changes God has brought our way. As cards come in the mail, I see how our family and friends are all growing and changing so much. How do kids grow so fast?! Here's a little secret: I'm one of "those" people who leave their Christmas cards up year 'round! Taking time to reflect allows us to see all of God's blessing and provision. Hindsight really is 20/20. So much time is wasted on worrying and yet God always comes through - just not always in the way we think He will. As we reflect on our past year and give praise to the God who keeps this earth spinning, let me leave you with 1 Corinthians 13:12. There will come a day when we will see our Lord face to face. As He knows and fully understands us, we will fully and understand the Lord our God. OH YES! The Best is yet to come! I'm your neighbor at Kate's! My son will be two next week and I can't believe how fast he is growing! They certainly do grow up fast. I think it's great to use Christmas cards as a way of reflection over the past year. Visiting you from FMF! Happy birthday to your little one! Isn't it crazy how fast they grow?! I agree, the best is yet to come! I love Christmas cards too and I keep them in a basket on the counter after the holidays so I can look at them :) enjoy that snow! 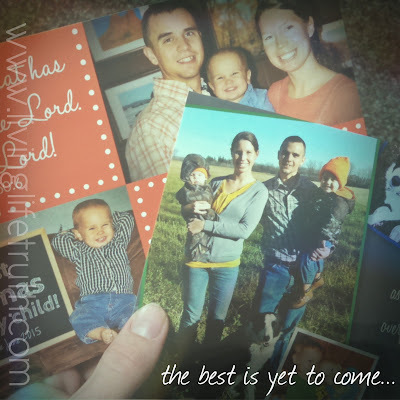 I love looking at those Christmas cards :) And E likes to point out the pictures of his little toddler friends, too. It's precious!